Microsoft Outlook is the most extensively used email client software. When Microsoft Outlook is installed in Exchange Server, it stores its contacts in a OST (Offline Storage Files). Sometimes these OST files gets corrupt and damage, as a consequence one cannot access the important contacts of OST file. This situation creates very serious problems like: business transaction may get stuck etc. Address Book Recovery software efficiently recovers contacts from corrupt or damaged OST files of Microsoft Exchange. 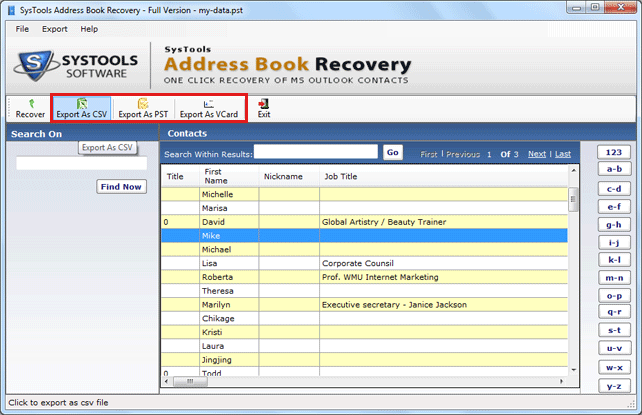 Exchange OST Address Book Contacts Recovery software helps to recover entire individual contacts. Users can save Exchange Outlook OST files contacts into vCard, CSV & PST file formats. Recover Exchange OST Contacts software perfectly supports to recover contacts of MS Exchange 2010, 2007, 2003, 2002, 2000, 2013 . Click to recover button to recover lost contacts. Select location of PST file Existing/New PST files and then click to "ok" button.